Home » News » What Should You Look for In Wichita Plumber Reviews? At the onset of the information age, it looked like the internet would answer all our questions for Wichita plumber reviews at the press of a button. But unfortunately, easy access to all plumbing reviews in the world has had the effect of sometimes making answers harder to find, not easier. Nowhere is this more the case than in navigating the endless rabbit holes of online consumer reviews. When looking for a plumber, it pays to know what specific positives and negatives people in your area have to say about the various plumbing services that ha­­ve received online reviews. What are the most important features of a quality visit from a plumber? Which companies provide consistently great service and which fall short? Here are some things to consider when perusing online plumbing reviews. First things first — when you have an issue with your plumbing, the last thing you want to do is sit around all day waiting for someone to come look at it. When going through reviews, make note of any comments on the promptness or tardiness of specific businesses. Many times when you need the services of a plumbing professional, it is necessary to shut off your water supply, meaning you cannot wash your hands, use the bathroom or even get a drink! Timely customer service is key. Any contact you make with a representative of any business should leave you with a good feeling, especially when you are trusting them to maintain or repair such a vitally critical system as your house or business’ plumbing. If you read a review — or more tellingly, a series of reviews — that indicates a particular company has a problem with the demeanor of its team members, it certainly does not recommend them well. Do the company’s employees identify themselves? Are they careful to work in such a way as to avoid soiling your house, and return things to their previous state when the job is completed? Are they well-groomed? Friendly and courteous? Are your questions answered in a straightforward and honest manner? These are all considerations to make before calling to schedule an appointment. When you contact a plumber you expect them to be trained, experienced and up-to-date in their knowledge of all aspects of plumbing systems. Keep an eye on the reviews and take note of any companies that have received a number of reports from customers dissatisfied by misdiagnosed problems or mistakes made onsite by their plumbers. When looking up reviews for practically anything, it pays to remember: People are much more quick to go online and leave a review when they have had a bad experience than when they are satisfied. This gives positive reviews a little more weight than negative ones, which might, for all you know, be motivated by some sort of personal grievance between the reviewer and someone at the company being criticized. In some cases, depending on the platform, businesses may have the option of paying to have their bad reviews mitigated, making their company look better than an honest sampling of feedback would. Its also important to know what certifications and awards the plumbing company may have. Are they licensed? Are they members of the Chamber of Commerce? Are they registered with the Better Business Bureau? Overall, if any given company has dozens or more reviews and the vast majority are positive, you are probably on the right trail. Remember, review sites and apps are useful but they do not provide a concrete guarantee that you are going to be happy with the service you receive in the end. Perhaps you have had reason to seek the services of a plumber, and you wish to let others know about your experience. But take heed: Even if you have had a bad experience, it is good policy to allow any business the opportunity to make up for it before you go online and blast them. Anybody can make mistakes, so please give them the benefit of the doubt until they honestly no longer deserve it. 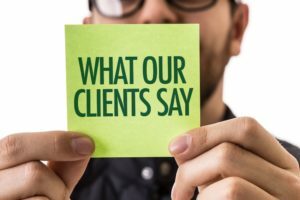 On the other hand, if you are completely satisfied, you will be doing the business — and other potential customers — a favor by giving them a glowing review. No matter what, it’s important to be honest in the summation of your feelings about your interaction with the company and its agents. Even a mediocre review can help them improve!